Now that the snow has melted out of the forests, and the lake has opened up, there’s the opportunity to take the boat across the water to the park to do a bit of hiking there again. I haven’t been in to the park to hike since last fall, and although much of the park along Kingsford is very similar to much of the non-park along Kingsford, it was still with some anticipation that I pushed the boat into the water. Raven didn’t share my enthusiasm. Although she’s getting more comfortable with splashing in the water, as long as her feet can touch bottom, and she’s come to enjoy car rides, sitting at the window with a big grin on her face, she is still rather apprehensive about the boat. I suppose that’s to be expected; she hasn’t had occasion to be in it since before the snows fell. We’re trying to get her over it by always making sure there’s a good romp at the other side. But in the meantime, she sits huddled by the driver with a worried expression and the occasional whimper. We had a really nice hike. Just a short one, I didn’t want to be gone too long, although I could easily have spent the whole day out. It was one of those perfect-weather days. Aside from a brisk breeze when you were down at the water, the temperature was just right – warm enough to be comfortable in a t-shirt, but not too warm to cause sweating. We walked across a couple of ridges, ending up at a small vernal pool where frogs were chirping. Unfortunately, Raven discovered it before I did, so by the time I reached it the frogs were no longer chirping. I called her back to me and we sat still together at the shore for a few minutes, hoping the frogs would feel danger had passed and start up again, but they didn’t. Ah well. Can’t really beat last weekend’s encounter anyway. Over the last week or so I had been checking the forests for wildflowers, watching for the first signs of some of my favourites. 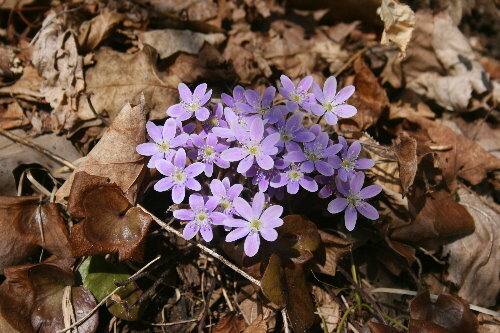 The hepatica have started blooming, and in some spots, particularly open south-facing slopes, they are prolific. However, there had been little sign of anything else. I found the odd green shoot here or there, but nothing I could definitively identify. I figured that the wildflowers were still a week or two away, so while I continued to watch, I wasn’t really expecting to see anything. So it was with a bit of pleasant surprise that I spotted a couple of Spring Beauties blooming beside the trail leading down to our dock. 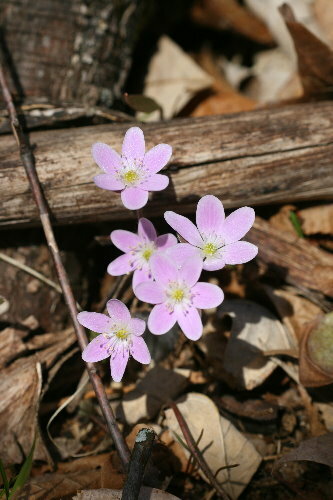 Small flowers, pale with pinkish stripey veins. Although they are widespread throughout the east, I only consciously recall encountering them when I was down on Pelee Island. I’m not sure why I would have missed seeing them around my parents’ old place, since it seems unlikely that they would have been absent. 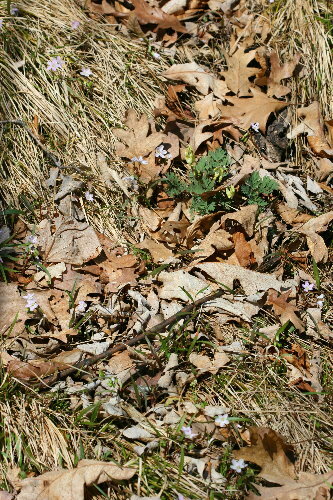 Over in the park, there were areas where they were so abundant they sprinkled the forest floor like garnish on a cake. And as delicious to the eyes as the cake is to the tongue. Speaking of tongue, apparently these flowers grow little tuber-like nodules on their roots which are edible and somewhat tasty when boiled. I was so focused on the Spring Beauties that I nearly missed these Bloodroot, not two feet away. Bloodroot is one of my favourite forest wildflowers, one of those species that you can see dozens of times and still point it out and say, “Look! 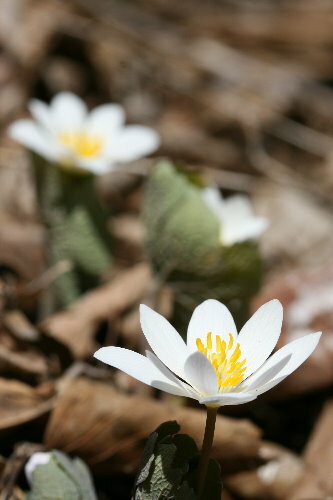 Bloodroot!”, each time anew. There were actually a few patches of it blooming on our southeastern-facing slope, but I encountered none in the park, not even furled-up leaves with the promise of becoming broad, snowy blossoms. Bloodroot, of course, takes its name from the orange-red juices that seep from the stem and veins when broken. Native Americans would use this colour as a dye, but more interestingly it can also serve as an effective insect repellent. Provided you don’t mind your face and skin being smeared with orange. As I carried on down the trail to the dock I started paying more attention to the green stuff that was poking up from the fallen leaves. 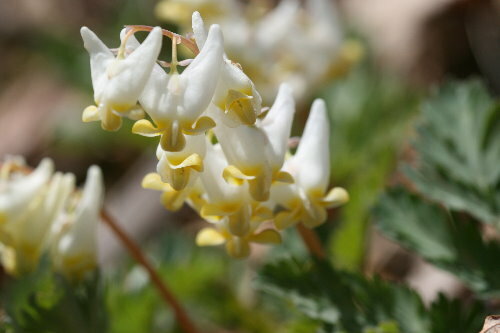 Up on the slope there was a large wash of it, and using my binoculars to get a closer look, it resolved into Dutchman’s Breeches – blooming! An extensive patch of the stuff, all with short spikes of white-and-yellow flowers. This is another species that I’ve only encountered on Pelee Island. It has a more southerly distribution but is still found through much of the east. It is related to the cultivated bleeding hearts found in many gardens (an Asian species, of course, although we also have native North American ones). 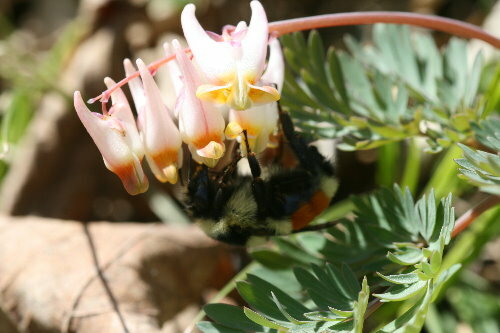 The deeper flowers of the Dutchman’s Breeches requires pollinators with long proboscises, and their primary visitors are bumblebees, such as the Tricolored Bumblebee below. I didn’t see any blooming in the park, either, although I did find a few that were getting close. It will be interesting to revisit the park in a week or so once everything’s opened up and blooming. 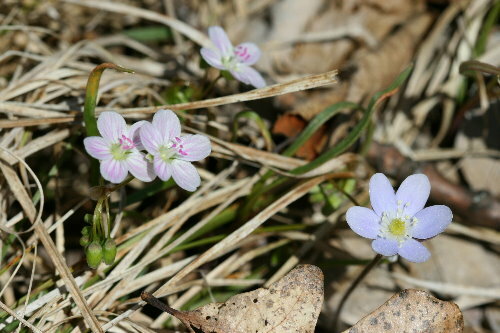 I have a feeling, from what I saw today, that it will be a veritable blanket of wildflowers covering the forest floor. These are beautiful, Seabrooke! Absolutely delightful! Knowing how far north you are of my location, one of the most beguiling things about this walk is the significant difference between your spring bloom and ours. At least a month ago a vast legion of wildflowers bloomed throughout the area here–with a great deal more still to come. Your post reminds me that spring and warmth march slowly northward like a blanket being drawn up from a bed. It’s made more fascinating by vicariously enjoying your walk through your words and images. Thank you! Thanks, Jason! It’s interesting to watch the spread of spring (or winter, at the other end of things) as it moves across the continent. It seems, sometimes, like it’s a long time coming here, anxiously waiting and watching neighbours to the south, but it’s always a great show when it finally arrives. Seabrooke, those dainty little fleurs are so sweet! Thanks for sharing them! God these were all beautiful…. The second photo of the surprise joyous spout of perfect lilac flowers coming out of the bland wood is absolutely gorgeous! It was almost as refreshing to see these as if I’d been out in the woods myself. THanks for bringing fresh air into my office! Great post. Saw my first Spring Beauties of the season this morning—a peppermint-tinged thrill. Thanks, everyone. There’s just something about spring wildflowers that seems to make them more beautiful than those of late summer – perhaps it’s their appearance as the first flowers after a long, empty winter.